Where you choose to get your puppy from is of course entirely your choice. However sometimes a person makes a choice with incomplete information and regrets that choice afterwards. 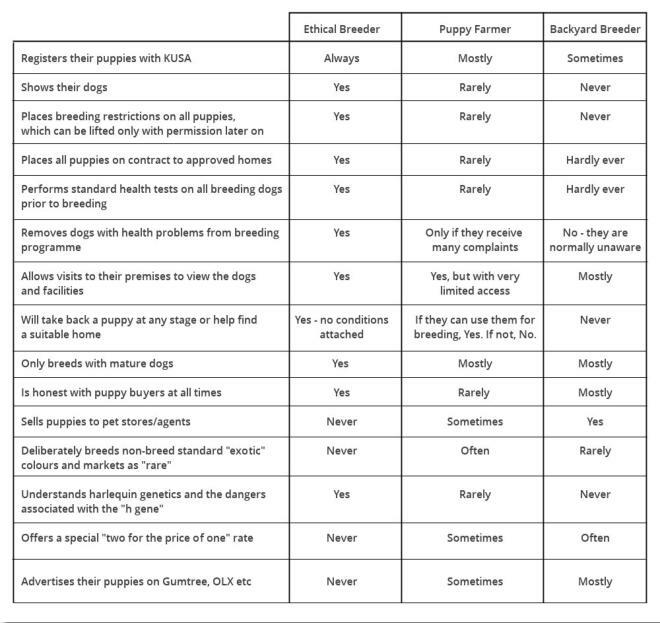 In the interests of helping prospective puppy owners make a more informed choice of breeder, we have complied the following comparison below (basic welfare such as water, food, shelter and veterinary care is assumed in all cases): The bottom line is that the motivation of the breeder is what defines the breeder --> • Ethical breeders breed to IMPROVE the Great Dane. The improvement should always be with respect to health and temperament first and foremost and then conformation and type i.e. ethical breeders do not breed to win at shows at the expense of health and welfare. Ethical breeders hope to break even on litters and any surplus is poured straight back into the dogs. For ethical breeders nowadays, breeding is a (mostly expensive) hobby and certainly not a way to make a living. • Puppy farmers breed to increase both the number of dogs and their bank balances. • Backyard breeders breed because they happened to have a male and a female Great Dane and it seemed like a good idea at the time. Most of the time one litter cures them of this condition. If you come across a puppy at a breeder in terrible conditions, please do not buy the puppy - yes, you may be helping that puppy there and then, but you are also actually supporting this terrible practice for the future. Report the person to the authorities immediately. The puppy/ies will be removed to a place of safety and the person held accountable - this stops the cycle. It is heart-breaking to leave a pup in a sub-standard situation even for a couple of hours, but “saving” the pup by taking/buying it unfortunately means that in a short time there is simply another litter of pups in its place. Please report to the authorities and break the cycle of exploitation. 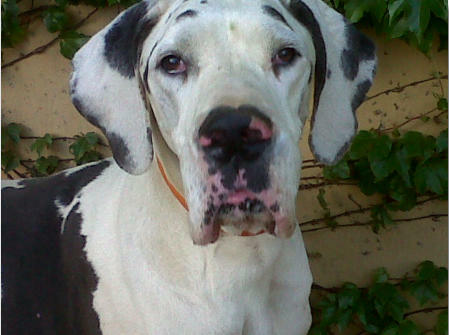 In some cases adopting an older Dane in need of a home (through no fault of their own) is actually a better choice than buying a puppy - find a rescue Dane. Rescue Danes are incredibly special - pictured left is the beautiful Victoria who needed a home after her beloved owner passed away. Victoria came to us at the age of seven to live out the rest of her days. She lived another 2 years, (and was a truly batty old girl!) but she was a total delight and we were very happy that we could offer this lovely old lady a home in her golden years. Rescues can be incredibly special - please consider one either instead of a pup or as a companion once your pup is settled. When it comes to getting a Dane to join your family, do your homework, ask a million questions and let your common sense guide you. Best wishes on your journey!